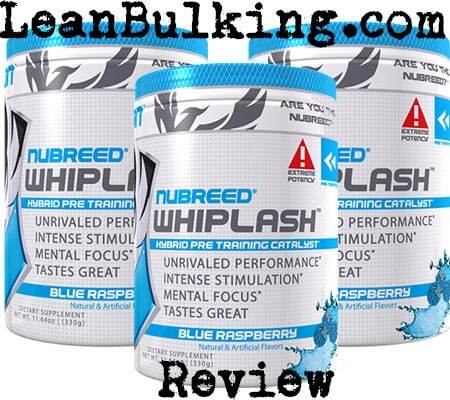 Whiplash is a pre-workout supplement made by Nubreed Nutrition. It costs $49.99 for 30 servings on their website, and comes in 3 flavors - Mango Orange, Blue Raspberry, and Lemon Drop. Nubreed Nutrition are a supplements company that markets numerous products - from fat burners to this pre-workout supplement. However, there wasn't much more information available on them, on their website. Read on to find out about Whiplash's ingredients. It's never good seeing proprietary blends on an ingredient list, and we were disappointed to see them on Whiplash's nutrient profile. We believe companies use proprietary blends to cut costs, while keeping the prices of their products high. Basically, these blends are mixtures of numerous ingredients that are only shown to you as one quantity (in this case, the 'Myosorb PH MATRIX' blend's overall quantity is 1,700mg). However, as you can see from the ingredient list, you're not shown the individual amount of the Citric Acid, Sodium Bicarbonate, or Malic Acid inside - meaning you don't know how good it really is (we can only judge how good an ingredient is by its dosage). Simply put, if a great ingredient is dosed badly, then it becomes ineffective - so you can see how important getting the dosages right is. 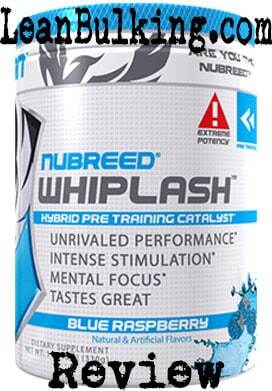 Anyway, we'll take you through each ingredient inside Whiplash; so you can see how good this pre-workout really is. We always have mixed opinions about this ingredient - basically, it can improve your muscular endurance in the gym, but it also causes paresthesia (see side effects section for more info). For this reason, we prefer Creatine Monohydrate (which offers the same benefit as Beta Alanine, without causing any side effects). These are the three ingredients inside Whiplash's Myosorb PH MATRIX proprietary blend. As we mentioned above, no-one knows the exact dosages of each ingredient (so bare this in mind when reading this section). But the most important thing about these three ingredients is - none of them really benefit your gym session. If Malic Acid is mixed with other ingredients, then it can give it a slight boost, but on it's own it won't do much. But that's not the worst part - sodium bicarbonate is used to bake cakes, pancakes and other desserts (so there's no need for it inside Whiplash). We believe that Nubreed Nutrition has added sodium bicarbonate in their pre-workout to cut costs - ultimately, we'll never find out if the Myosorb PH MATRIX blend is filled with sodium bicarbonate. We hate Betaine in supplements, because it's proven to be ineffective in almost every study conducted on it. Not only that, it's been reported to cause fishy odors in your breath and sweat - not an enjoyable side effect to suffer from. This is extracted from L-Arginine, which isn't a good thing. While L-Arginine can be great inside your body, it has a poor absorption rate so it's ineffective when orally supplemented (meaning anything extracted from it is too). Simply put, Agmatine Sulfate won't deliver any benefits when consumed in supplements. This is the second proprietary blend inside Whiplash; so remember that no-one knows the exact dosages of each ingredient inside here. Out of all of these ingredients, only 1 has proven to be beneficial in studies (L-Tyrosine, which boosts your focus in the gym). However, a raise in cognition is a benefit that stimulants such as Caffeine will deliver, and Caffeine is also part of Whiplash - so there's not really any need to L-Tyrosine here. We believe L-Tyrosine is only useful in pre-workouts when they're 'stim-free' (meaning they don't contain any Caffeine). 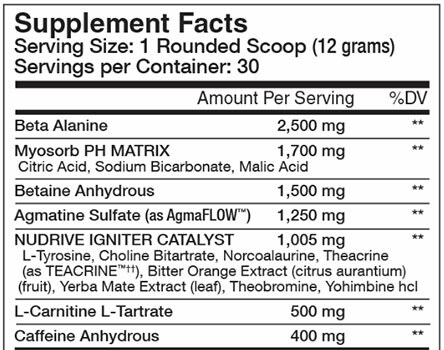 Anyway, the worst part about this 'Nudrive Igniter Cataylst' blend is that it contains 2 ingredients that have been banned in the UK and Canada after causing harmful side effects (Synephrine & Yohimbine) - we've suffered from bad side effects after taking these ingredients before, so we stay the f*ck away from them. Finally, there are 3 different stimulants in this blend (Theacrine, Yerba Mate Extract, and Theobromine). Basically, it's not good putting many stimulants into proprietary blends - consuming too many stimulants can lead to jitters and energy crashes. As they're is part of a proprietary blend, no-one knows the exact dosages of these stimulants here (meaning you're at risk from suffering from side effects). The only stimulant you need in a pre-workout is Caffeine; we'll explain why further below. Nubreed Nutrition has done well by dosing L-Carnitine perfectly here at 500mg per serving. Studies have proven that this ingredient reduces fatigue and muscle damage, while increasing your focus in the gym - which is why it's one of our favorite pre-workout ingredients. Caffeine is our favorite stimulant in any supplement - it's proven to be safe and effective, and is consumed around the world on a daily basis (in tea & coffee). Not only that, it's proven to improve your strength, endurance, energy and focus in the gym (all key benefits to have from taking a pre-workout supplement). For this reason, we believe it's perfect in pre-workouts, but Nubreed Nutrition has dosed Caffeine too high (400mg, which is a HUGE dosage per serving). We make sure to consume Caffeine dosages under 200mg per serving (to avoid side effects such as jitters and energy crashes). To put this into perspective, 400mg is the maximum you should consume daily - so having this in 1 serving is HUGE. Not only that, Whiplash already contains 3 stimulants, so you're almost certain to experience jitters and energy crashes here. If you're sensitive to Caffeine, then consume dosages under 200mg like we do (this amount is big enough to deliver benefits, but keeps you safe too). Read on to find out about the potential side effects of taking Whiplash pre-workout. There are many ingredients in Whiplash pre-workout that can cause side effects; Beta Alanine, Betaine, Choline, Bitter Orange Extract, Yohimbine, and the large number of stimualants (Yerba Mate, Thebromine, Theacrine, and Caffeine). First thing's first - if you're reading this section to learn what paresthesia is, then we'll give it to you now. Paresthesia is a tingling sensation on the skin of your face and body (it's not going to kill you, but it's very distracting when you're trying to focus on your gym session). This is very commonly caused by Beta Alanine; as we've mentioned, Creatine Monohydrate offers the same benefit (enhances muscular endurance), without causing any side effects, so it's a better option in a pre-workout). Moving on, it's important to remember that Caffeine only causes side effects when dosed over 200mg per serving, or added into supplements that already contain other stimulants (Whiplash pre-workout is guilty of both of these things, so your risk of side effects are very high). Not only that, Bitter Orange Extract (Synephrine) and Yohimbine have been banned from countries such as the UK and Canada - after causing harmful side effects. As you can see above, there's a high chance you'll suffer from side effects from taking Whiplash pre-workout. Side Effects are something we always try to avoid, so we recommend avoiding supplements like this one - there are much better products available that contain better ingredients in safer and more effective dosages. As a general rule, we also recommend consuming under 200mg Caffeine per serving in pre-workouts (this will keep you safe from side effects, and you'll still experience its full range of benefits). Ultimately, if you’re paying for a supplement, then why would you spend your cash on a product that can cause numerous side effects? We always choose supplements that are free from side effects and are filled with key ingredients that’re proven to boost your gym session – to help you reach your fitness goals faster. In our honest opinion, we don’t believe that Whiplash can compete with the best pre-workouts available right now.